Bombardier Inc. (French pronunciation: ​[bɔ̃baʁdje]) is a multinational aerospace and transportation company based in Montreal, Quebec, Canada. Bombardier started as a maker of snowmobiles, and is now a large manufacturer of regional airliners, business jets, and mass transportation equipment, as well as a provider of financial services. Bombardier was founded by Joseph-Armand Bombardier as L'Auto-Neige Bombardier Limitée ("Bombardier Snow Car Limited") on July 10, 1942, at Valcourt in the Eastern Townships, Quebec. 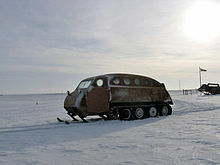 A mechanic who dreamed of building a vehicle that could "float on snow;" in 1935, Bombardier designed and produced his first snowmobile in a small Valcourt, Quebec repair shop, following the death of his two-year-old from appendicitis complicated by peritonitis in January 1934, when a blizzard prevented him from reaching hospital in time to save his son. Bombardier's technological breakthrough in the design of bush vehicles came in the mid-1930s when he developed a drive system that revolutionized travel in snow and swampy conditions. In 1937, Bombardier sold 12 snowmobiles, named the B7 and, in 1942, created l'Auto-Neige Bombardier Limitée company. The first snowmobiles were large, multipassenger vehicles designed to help people get around during the long winter months. Snowmobiles were used in rural Quebec to take children to school, carry freight, deliver mail, and as ambulances. His invention filled a very particular need in the region and soon business was booming. In 1941, Armand opened a new factory in Valcourt. Then a major setback hit the growing business: the Second World War was well underway and the Canadian government issued wartime rationing regulations. Bombardier customers had to prove that snowmobiles were essential to their livelihood in order to buy one. To keep his business going, Armand shifted his focus and developed vehicles for the military. After the war, Bombardier experienced another setback in his snowmobile business. In 1948, the Quebec government passed a law requiring all highways and local roads to be cleared of snow; the Bombardier company's sales fell by nearly half in one year. 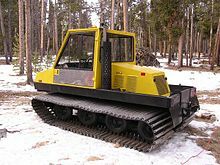 Armand Bombardier therefore decided to diversify his business, first by producing tracked snowplows sized specifically for use on municipal sidewalks (replacing horse-drawn vehicles), then by making all-terrain vehicles for the mining, oil, and forestry industries. Of note, the machines had removable front skis that could be replaced with front wheels for use on paved or hard surfaces, thus providing greater utility to his large snowmobiles. Production of these machines evolved over time. During 1951, the wooden bodies were replaced with sheet steel and these vehicles were powered by Chrysler flathead six-cylinder engines and 3-speed manual transmissions. In the 1960s, V-8 engines began to appear and during the 1969/1970 production years, the standard round "porthole"-style windows were replaced with larger rectangular windows which allowed more interior light and made them feel less claustrophobic. Following these changes came the switchover to more reliable Chrysler Industrial 318 engines with the automatic Loadflite transmissions. Production of these machines continued into the mid-1970s. Bombardier wanted to develop a fast, lightweight snowmobile that could carry one or two people. In the early 1950s, Armand set aside his dream to focus on developing his company's other tracked vehicles, but by the end of the decade, smaller, more efficient engines had been developed and were starting to come onto the market. Bombardier resumed his efforts to build a "miniature" snowmobile. He worked alongside his eldest son Germain, who shared his father's mechanical talents. Armand and Germain developed several prototypes of the lightweight snowmobile and finally, the first Bombardier snowmobile went on sale in 1959. The Ski-Doo snowmobile was originally called the "Ski-Dog" because Bombardier meant it to be a practical vehicle to replace the dogsled for hunters and trappers. By an accident, a painter misinterpreted the name and painted "Ski-Doo" on the first prototype. The public soon discovered that speedy vehicles that could zoom over snow were a lot of fun. Suddenly, a new winter sport was born, centred in Quebec. In the first year, Bombardier sold 225 Ski-Doos; four years later, 8,210 were sold. But Armand was reluctant to focus too much on the Ski-Doo and move resources away from his all-terrain vehicles. He vividly remembered his earlier business setbacks that forced him to diversify. Armand slowed down promotion of the Ski-Doo line to prevent it from dominating the other company products, while still allowing him to dominate the snowmobile industry. The snowmobiles produced were of exceptional quality and performance, earning a better reputation than the rival Polaris and Arctic Cat brand of motosleds. In 1971, Bombardier completed the purchase of the Moto-Ski company. On February 18, 1964, J. Armand Bombardier died of cancer at age 56. He left behind a thriving business, but also one that had been focused on one person. Armand dominated his company, overseeing all areas of operation. He controlled the small research department, making all the drawings himself. By the time of his death, sales of the company had reached C$20 million, which is the equivalent of C$160 million in 2004 dollars. The younger generation took over, led by Armand's sons and sons-in-law. The young team reorganized and decentralized the company, adopting modern business tactics. The company adopted the latest technological innovation—the computer—to handle inventory, accounts, and billing. Distribution networks were improved and increased, and an incentive program was developed for sales staff. In 1967, L'Auto-Neige Bombardier Limitée was renamed Bombardier Limited and on January 23, 1969, the company went public, listing on the Montreal and Toronto stock exchanges. In October 2016, Bombardier Inc. announced that, by the end of 2018, they will slash up to 7,500 jobs or more than 10 percent of 70,900 employees from 2015. About a half of job cuts will be done in railway technology unit. In November 2018, Bombardier Inc. announced they were cutting 5,000 jobs and discontinuing their turbo-prop passenger aircraft production over the next 12 to 18 months. In 1986, Bombardier acquired Canadair after the Canadian government-owned aircraft manufacturing company recorded the largest corporate loss in Canadian history. Shortly thereafter, de Havilland Canada, Short Brothers and Learjet operations were absorbed by the aerospace arm, which now accounts for over half of company revenue. Bombardier's most popular aircraft currently include its Q400, CRJ100/200/440, and CRJ700/900/1000 lines of regional airliners. Bombardier also manufactures the Global Express and the Challenger business jet. Learjet continues to operate as a subsidiary of Bombardier, manufacturing jets under the Learjet marque. The slogan was changed in 2012 from "We Move People" to "Evolution of Mobility." After some delay in its development of the Bombardier C Series, the CS100 and CS300 now compete with the smaller aircraft in the Airbus A320 family and the Boeing 737 family. On June 29, 2016, Bombardier delivered the first C Series CS100 aircraft to Swiss International Air Lines, which were the launch customer for the new aircraft. Subsequently, both Air Canada and Delta Air Lines placed firm orders for the CSeries. The CS300 is the latest plane offered by Bombardier with up to 160 seats. In May 2017, Bombardier and the state-owned Chinese air company Comac began holding talks about an investment into Bombardier's passenger jet business. In late September 2017, the U.S. Department of Commerce proposed a 219% tariff on Bombardier CSeries aircraft to be imported into the country. This was a preliminary ruling on a complaint by Boeing that Bombardier was selling the CS100 to Delta Air Lines at unduly low prices, due to subsidies from the governments of Canada and Quebec; these allegedly produced an unfair competitive advantage. Boeing's complaint stated that the CS100 was being sold at US$19.6 million each, below the US$33.2 million production cost. The governments of Canada and the UK also promised their support, threatening to stop ordering Boeing aircraft since the company was putting aerospace jobs at risk. On January 26, 2018 the U.S International Trade Commission ruled that the CSeries planes do not harm US industry and Boeing was not harmed by Bombardier’s prices. Therefor the tariff's were overturned. Bombardier called the decision "a victory for innovation, competition and the rule of law." On October 16, 2017, the Airbus Group bought a 50.01% majority stake in the CSeries Aircraft. Airbus will create a second CSeries assembly line at their A320 assembly facility in Mobile, Alabama, to avoid the duties imposed by the U.S. Department of Commerce. The deal contains a provision which allows Airbus to eventually buy out the remaining stake in the aircraft held by both Bombardier and the Québec government. During the 1970s, Bombardier began to enter the railway passenger car business with domestic orders for commuter and subway systems, winning its first order for mass transit rolling stock in 1974 for the Société de transport de Montréal (STM) (Montreal transport authority) to build MR-73 metro trains for the Montreal Metro. The core of Bombardier Transportation was formed with the purchase of Montreal Locomotive Works (MLW) in 1975 (sold to General Electric in 1988). In a 1985 corporate reorganization, Bombardier removed itself from manufacturing locomotives and concentrated on producing passenger train rolling stock, aircraft and recreational products. In the late 1980s Bombardier Transportation gained manufacturing capacity in the US and Europe, acquiring a 45% share in BN Constructions Ferroviaires et Métalliques (whose principal site was in Brugge (Bruges), Belgium) in 1986, buying the assets of US railcar manufacturers Budd and Pullman-Standard in 1987, and acquiring of ANF-Industries (whose principal site was in Crespin, France, near the Belgian border) in 1989. A series of acquisitions in the UK, Germany, Switzerland, Canada and Mexico further increased Bombardier Transportation's operations. In 2001, Bombardier acquired Adtranz (DaimlerChrysler Rail Systems), a manufacturer of trains which were widely used throughout Germany and Great Britain. Bombardier was one of the companies that took over British Rail's Research and Development facilities after privatisation (the remainder largely being absorbed into AEA Technology and Alstom). With the acquisition of Adtranz from DaimlerChrysler, Bombardier Transportation emerged as one of the largest manufacturers of railway rolling stock in the world. Bombardier Capital (BC) was the Bombardier division in charge of financial services. From 1973, when it was based in Colchester, Vermont, it offered financial services such as lending, leasing, and asset-management throughout the Americas. In 2001, BC restricted its loan activity to existing customers. The company, which began transitioning some services to Jacksonville, Florida, in 1997, ceased taking on new consumer loans in 2001, focusing instead on loans to retailers and gradually downsizing. In November 2004, Bombardier's credit evaluation was downgraded by Moody's from "moderate credit risk" (Baa3) to "questionable credit quality" (Ba2), a below investment grade rating which impacted Bombardier Capital, although the company's transportation division was unaffected. In 2005, Bombardier sold the Inventory Finance Division of BC to GE Commercial Finance. Bombardier used to be a major Canadian defence contractor. With the latest[which?] restructuring, the company sold off nearly all of its military-related work in Canada. Military Aviation Services was sold to SPAR Aerospace and land-based defence products made by Urban Transportation Development Corporation ceased operations as Bombardier moved away from non-aviation defence products. On 27 August 2003, Bombardier, Inc. announced the sale of its BRP (Recreational Products) unit to a group of investors: Bain Capital (50%), Bombardier Family (35%) and Caisse de dépôt et placement du Québec (15%) for $875 million. As part of the deal, BRP retained rights to the sprocket logo, which it subsequently modified. Its snowcats and snowmobiles dated back to the origins of the company; current brands are Ski-Doo and Lynx. Bombardier Recreational Products has also become well known for its Sea-Doo personal watercraft division which also features jet-powered sport boats. Bombardier also makes all-terrain vehicles (ATVs). In 2006, the Bombardier ATV was rebranded as Can-Am. Can-Am was the name of the line of dirt bikes it produced in the 1980s which used high-tech engines featuring Rotax Automatic Variable Exhaust (RAVE) valving to create peak power at a wider range of RPMs. The bikes were shelved but technology tweaks re-emerged in the company's Ski-Doo snowmobiles (beginning with the 1989 model year Ski-Doo Mach 1). Many of today's snowmobiles produced by the company feature proprietary engineering by BRP's Rotax brand engine production plant located in Austria. BRP's Can-Am product is among the high tech recreational vehicles which include the Can-Am Spyder, a three-wheel roadster with a rear-drive wheel and featuring a vehicle stability system (VSS), anti-lock braking system (ABS) and other safety and electronic vehicle control enhancements as certified by the National Highway Traffic Safety Administration (NHTSA). In the late 1970s in Ireland, Córas Iompair Éireann (now Bus Éireann and Dublin Bus) commissioned a range of single and double decker buses to be designed and produced. The prototypes were devised in Germany and production was carried out in Shannon, Co. Clare, Ireland. A total of 51 express coaches (KE type) and 366 double deck buses (KD) were assembled at this facility between 1980 and 1983. They remained in service until 1997 and 2000 respectively. Some surviving examples are now exhibits at the National Transport Museum of Ireland in Howth, Co. Dublin. The Bombardier Museum is a large modern museum in Valcourt, Quebec dedicated to the life of Joseph-Armand Bombardier, the snowmobile, and the industry he helped create. Opened in 1971, with substantial renovations in 1990, the museum is professionally curated and features a wide array of Ski-Doos, other industrial designs, and a selection of related books, booklets and other items of interest to enthusiasts. Also of note at the museum is the original garage "factory" that was the genesis of the Bombardier organization. The garage was carefully removed from its original location in Valcourt and moved to its present site at the museum, which is located blocks away from the present-day Bombardier Recreational Products factory. ^ a b "1939 to 1945: The War Years." Archived 2013-02-12 at the Wayback Machine Musée J.-Armand Bombardier. Retrieved: January 4, 2013. ^ a b c "2016 Financial Report" (PDF). Archived from the original (PDF) on 26 February 2017. Retrieved 17 March 2018. ^ The Canadian Encyclopedia"Historica Canada: Joseph-Armand Bombardier". Retrieved August 8, 2018. ^ "2003: Bombardier sells of historic Ski-Doo line". CBC Digital Archives. 2003. Retrieved 2013-04-13. ^ Skorupa, Joe (January 1992). "Ski-doo: 50 years on snow". Popular Mechanics. New York, NY: Hearst Magazines. 169 (1): 94, 95. ISSN 0032-4558. Retrieved Apr 11, 2013. ^ Allison Lampert (October 21, 2016). "Bombardier to cut 7,500 more jobs through 2018, mostly in rail". ^ "Bombardier to cut 5,000 jobs and sell $900m of assets". Financial Times. 8 November 2018. ^ "Restoration Primer – Sec. 3.1 Canadair." Archived 2007-06-19 at the Wayback Machine Project North Star. Retrieved: January 4, 2013. ^ The Canadian Press (28 June 2016). "Air Canada finalizes $3.8B order for 45 Bombardier C Series jets". Toronto Star. Toronto, Ontario. Retrieved 29 June 2016. ^ "Air Canada finalizes $3.8B order for 45 Bombardier CSeries jets - The Star". Retrieved 19 October 2018. ^ "Delta buying 75 Bombardier CSeries jets, with options for 50 more - CBC News". Retrieved 19 October 2018. ^ the C Series. uK,. June 2015. p. 5. ^ Weinland, Don (May 18, 2017). "Chinese group in talks to aid struggling jet maker Bombardier". Financial Times. United Kingdom. Retrieved May 18, 2017. ^ "Fallon warns Boeing over defence contracts". 27 September 2017. Retrieved 19 October 2018 – via www.bbc.com. ^ "Amid spat with Bombardier, Boeing won't be considered for future fighter jet replacements, Sajjan suggests". 28 September 2017. Retrieved 19 October 2018. ^ Elliott, Larry (28 September 2017). "Theresa May hints at Boeing boycott in Bombardier US tariff row". the Guardian. Retrieved 19 October 2018. ^ "Bombardier wins bid to overturn 292% tariffs at U.S. trade body". CBC. Canadian Broadcast Corporation. Retrieved 3 March 2019. ^ "Airbus shakes up industry with majority stake in Bombardier CSeries program". Montreal Gazette. 2017-10-17. Retrieved 2017-10-17. ^ "Europe's Airbus to buy majority stake in Bombardier CSeries program". Montreal. 2017-10-16. Retrieved 2017-10-17. ^ "History of Bombardier - Planes and Trains". Bombardier.com. Retrieved 1 March 2017. ^ a b "Bombardier Capital Drives ERP Efficiency." Information Builders.com. Retrieved: February 22, 2009. ^ a b c "Jacksonville's Bombardier Capital cuts hundreds of jobs." Florida Times-Union, September 27, 2001. Retrieved: February 22, 2009. ^ Bennett, Jane. "Bombardier reduces space." Jacksonville Business Journal, October 4, 2002. Retrieved: February 22, 2009. ^ Jelter, Jim. "Moody's downgrades Bombardier." Wall Street Journal, November 11, 2004. Retrieved: February 22, 2009. ^ "Bombardier "hold"". 2005-04-20. Retrieved 2009-02-22. ^ "GE Capital Solutions Signs Exclusive Agreement with BRP." Fox Business, May 28, 2008. ^ "Bombardier Announces Sale of its Military Aviation Services Unit - Bombardier". www.bombardier.com. Retrieved 2017-01-03. ^ "Bombardier Recreational Products News." rbbi.com. Retrieved: January 4, 2013. ^ "How Sea-Doo Launched the Personal Watercraft Industry". Retrieved 2014-12-11. ^ Conway, Shane. "The Bombardier buses and coaches of CIE." The Classic Irish Buses website, August 15, 2010. Retrieved: August 17, 2010. ^ "About us". Retrieved 2019-03-17. Descarries, Eric. "Autoneiges Bombardier: Des patenteux perpétuent la tradition." La Presse, 13 March 2006. Hadekel, Peter. Silent Partners: Taxpayers and the Bankrolling of Bombardier. Toronto: Key Porter Books Limited, 2004. ISBN 1-55263-626-7. MacDonald, Larry.The Bombardier Story: Planes, Trains and Snowmobiles. Toronto: J. Wiley & Sons, 2001. ISBN 0-470-83196-0. Wikimedia Commons has media related to Bombardier. Look up Bombardier in Wiktionary, the free dictionary.